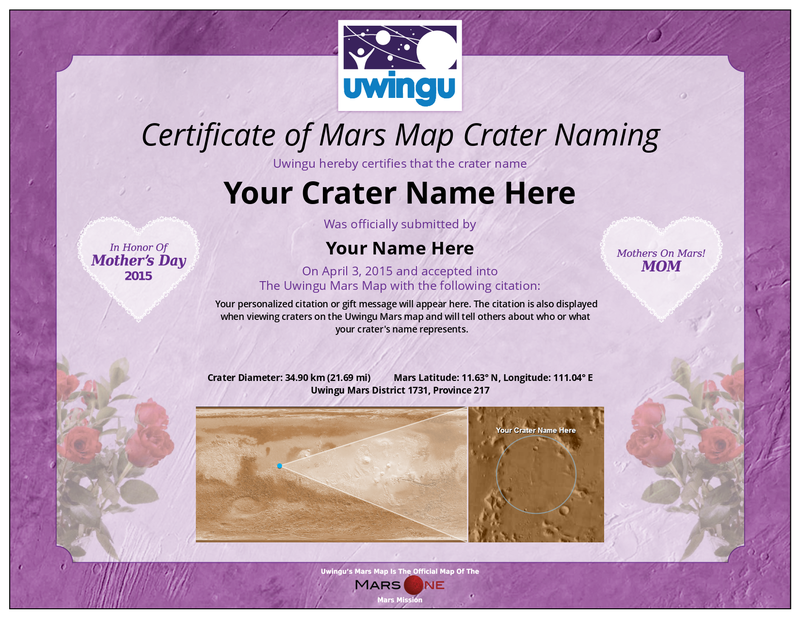 We just announced a special campaign to honor moms for Mother’s Day with place names on our Mars map. Through Mother’s Day—Sunday May 10th—we are offering decorative Mother’s Day certificates for anyone choosing to honor a mom in this celestial way. Two certificate options are available: either an electronic downloadable version or a beautifully printed and framed keepsake version. Uwingu’s Mars Map will be carried to Mars aboard the first Mars One robotic lander. We also announced that those purchasing the 50 largest craters named before Mother’s Day 2015 will receive a 2-for-1 bonus: a gift certificate of equal value; allowing them to put additional crater names on the Mars map for free anytime in 2015, including Father’s Day. Prices for naming craters depend on the size of the crater, and begin at $5. Half of Uwingu’s revenues go to fund the Uwingu Fund for space research and education grants.